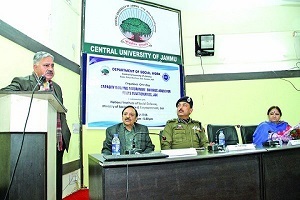 Department of Social Work, Central University of Jammu (CUJ) organised ‘One Day Capacity Building Programme on Drug Abuse for Police Functionaries, J&K’ in collaboration with National Institute of Social Defence, Ministry of Social Justice & Empowerment. Narco- terrorism is the biggest threat that the State is grappling with at present and the role of Police in curbing this menace cannot be undermined. The programme was aimed at strengthening the capacity of Police functionaries in understanding the psychological, social and security concerns in relation to drug abuse and prevention. During this one day programme, enriching lectures were delivered by Suneel Vatsayan (NADA Foundation, Delhi), Ramesh Kotwal, SSP, Head, Anti Narcotic Wing and Dr. Gurmeet Kour, Incharge Police Drug De-addiction Centre Jammu. 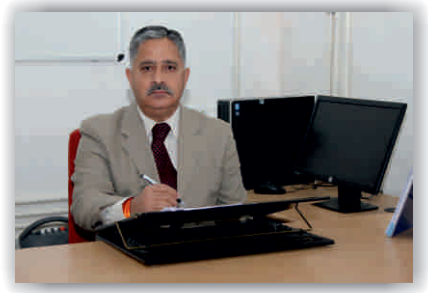 Dr S D Singh, IG Police Jammu, was the special guest in the valedictory function. He appreciated the programme by stating that drug addiction is the bigger problem than terrorism and other crimes, and the programs like these help people to understand its dimensions and how to tackle with these problems. Prof. Ashok Aima, Vice Chancellor, CUJ and Prof. Lokesh Verma, HoD, Department of Social Work, also shared their views on drug abuse and prevention. The programme was facilitated by Dr Nancy Mengi, Mr. Vinay Kumar, Dr. Ranvir Singh and Ms. Yangchn Dolma from Central University of Jammu.